Knowing what the right decision is and making it can be difficult at times. It can also be difficult to listen to others with more knowledge than yourself. This can be especially true for children. That's why it is important to teach them about the role wisdom plays in their lives. 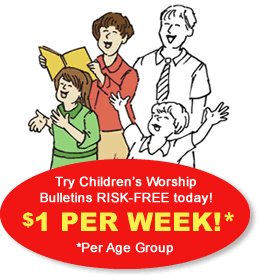 You can start this lesson with Sunday school activities about wisdom derived from Children's Worship Bulletins. The activities included in our bulletins are all Bible-based and full of games including pictures, puzzles, mazes, word pictures, codes and more. Your students will enjoy the activities while learning about Scripture. With hundreds of bulletins to choose from, you will have no trouble finding the right bulletin on wisdom for your classroom. You can then easily create games and activities inspired by our bulletins. Below is one example of the Children's Worship Bulletins on wisdom. We have adapted this bulletin into an introductory exercise to start your classroom wisdom lesson. Make enough copies of the bulletins so that each student has one. Print an enlargement of the puzzle. Hand out the activity pages and crayons. Put the enlargement up on the wall. Ask the children to take turns circling the hidden objects in the enlarged picture. Then they can find and circle the hidden objects in the picture on their paper. When students are finished ensure everyone has all the correct answers. Hand out prizes to everyone. Begin your lesson on wisdom by encouraging your students to listen to those who are older and wiser. Have them choose trusted people who have their best interests in mind when asking for advice. Ask them who they can trust to give them good advice. Encourage them to pick good role models like parents, grandparents, teachers and policemen. Our bulletins come in both black-and-white and color. With our large selection you can download as many bulletins as you need, so you will never run out of ideas for your Sunday school classes. All of our activities, including the ones about wisdom, are based on a passage from the Old Testament, the Gospels or the Epistles. You'll find that your students have fun while they learn. This is one of the best ways to help them retain the information.